Christmas is most often a time for families and friends to come together to celebrate. It's a chance to quite literally 'deck the halls' and bring the festive cheer indoors. But unfortunately Christmas has also become a time when finances are stretched, which can bring extra strains and pressure that needn't otherwise exist. Christmas doesn't have to be this way, and you certainly needn't spend a fortune on plushly decorating your home. There are so many frugal ways to elegantly make your own Christmas ornaments and decorations. Making your own Christmas decorations for the Christmas tree or room is easy, and a great way to indulge in Christmas cheer. You can also save even more money and create eco-friendly decorations by recycling materials. Kids and adults will love working together to create that holiday feel for a fraction of the price. Preheat the oven to Gas Mark 4 (160C or 180C for fan assisted ovens). Cream the butter and caster sugar before adding the egg yolks, bicarbonate of soda and golden syrup. Add in the flour, ginger and cinnamon and thoroughly mix. Then take the mixture and divide into a couple of balls, kneading until a sufficient dough is created. The dough needs to be chilled in the fridge for around half an hour. After this time, remove the dough and using a rolling pin, roll out each ball to just under 1cm in thickness. Then using your dough cutter, cut out all the shapes and using a chopstick, make a small hole in the top of each shape for the ribbon to go through. Place each shape on the greased baking tray, re-rolling the dough trimmings as needed. Once you have enough gingerbread shapes, you will need to cook them in the oven for around 10 minutes, or until golden brown. The gingerbread can be placed out on the tree for a couple of days before being eaten, or left to go stale and used purely as decorations. If kept airtight, the gingerbread will last for around 1 week. 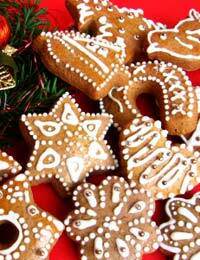 These gingerbread Christmas decorations also make great little gifts for friends and family. You can also make chocolates and sweets for the tree. Simply find a recipe of your choice, and then wrap in cellophane (florist's cellophane is usually your best bet), material, tie with band or ribbon and place on the tree. Alternatively, the age old threading of popcorn or nut shells to create a rustic mantelpiece decorations is another great idea for kids to get involved with. Many traditional Christmas decorations use natural materials, so there's no reason why you can't expand on this tradition to make your own stylish Christmas decorations. Try scouring your local park for a few pine cones that have fallen from the trees. These can then be dried out at home. You could leave them 'as is', and simply tie a piece of metallic string or ribbon to them, or give them a slight spray of gold or silver for a more vibrant look. The cones can be used singularly as Christmas tree decorations, or incorporated into wreathes or table pieces. Alternatively, why not scatter a few pinecones around church candles for a simple yet elegant Christmas display. A few days before Christmas, you could also collect together pieces of ivy. Try picking lengths of ivy that trail, as these can be woven together around picture and mirror frames, candles or draped over mantelpieces. Sprigs of holly, fir or mistletoe are also popular Christmas décor pieces, and can be bunched together and hung from door frames or doorknobs. If you want to bring some gorgeous spicy Christmas fragrance into your house, there is no easier way than using oranges. Slice the oranges to a thickness of just under 1cm, then very very slowly dry them out in the oven on a low temperature setting. Once the orange slices are dry, a loop of ribbon can be added to make them into Christmas tree decorations, or they can be incorporated with cloves and cinnamon as part of a Christmas pot pourri mix. Whole satsumas or oranges can also be decorated with cloves and placed on the tree or on a mantelpiece. I have been scanning the net for edible christmas decorations. My daughter and I have decided this year we would make all the decorations on our tree edible. It is great fun for mother and daughter even though shes 19. It gives us some alone time to chat and bake together and watch the cats trying to work out the most efficent rout up the tree. Thank you for posting this wonderful recipe.